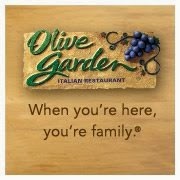 Olive Garden is offering a coupon valid for a FREE kid's meal with the purchase of an adult entrée – valid only today – April 23rd! Please note that there is a limit of 2 free kid's meals with the purchase of 2 entrees per coupon. And you can use this coupon for dine-in OR to-go orders!